In Europe, Australia, and the United States, healthcare officials and law enforcement agencies have reported increased abuse of a white-powder substance marketed as "bath salts." This designer drug contains MDPV and is sold in convenience stores, specialty shops, and online. Users snort the powder to get high and because of this, it has been nicknamed "fake cocaine." Some of the bath salts products that are used as fake cocaine are called Ivory Wave, Bliss, Blue Silk, Charge Plus, White Lightning, Cloud 9, and Energy 1. There are a number of other product names and they continually change. Most often, these products are marketed as "bath salts." However, in attempts to thwart the law, they've also been labeled as "plant food," "glass cleaner," and "research chemicals." The active ingredient in bath salts products is the designer drug methylenedioxypyrovalerone (MDPV). It's structurally related to cathinone, an active alkaloid found in the khat plant. It is a central nervous system stimulant. MDPV is a class of drug known as a synthetic cathinone, variants of which have been used as ingredients in various bath salts products. Synthetic variants of cathinone can be much more potent than the natural khat product and sometimes very dangerous. MDPV is similar to pyrovalerone, a stimulant first synthesized in 1964. Sold under the trade names Centroton and Thymergix, pyrovalerone is used as an appetite suppressant or for the treatment of chronic fatigue. MDPV, though, is not approved for medical use in the United States. MDPV is the most common synthetic cathinone found in the systems of patients admitted to emergency rooms after taking bath salts. Synthetic cathinone usually appears as a white or light tan powder. It is sold in 500-milligram bottles or plastic bags labeled "bath salts." The packages also usually say "for novelty use only" or "not for human consumption." Users typically snort the white powder to get high. It can also be smoked or taken orally. Typically, synthetic cathinone loses its potency when mixed with a solution, so it's not commonly injected. However, more recent DEA reports do include this method. Law enforcement and healthcare providers in Europe, Australia, and the United States report that users are mostly teenagers and young adults. However, a study in Southern Germany found that most users admitted to the hospital for MDPV-related problems were men in their 30s. It's also noted that many of these men were not naive about illicit drugs. The baths salts products containing MDPV are being sold in the same stores and outlets that previously sold fake marijuana products. Scientific studies on the effects of MDPV on humans or on proper dosing are not complete. However, health officials have reported that users of the drug report feelings of empathy, stimulation, alertness, euphoria, and awareness of senses. The effects are likened to those of methamphetamine, MDMA, and cocaine. In addition, there are reports of death due to the abuse of this class of drugs. MDPV has been in circulation since at least 2007 in Germany. European healthcare officials report that users are "losing touch with reality" and are being treated in mental institutions. 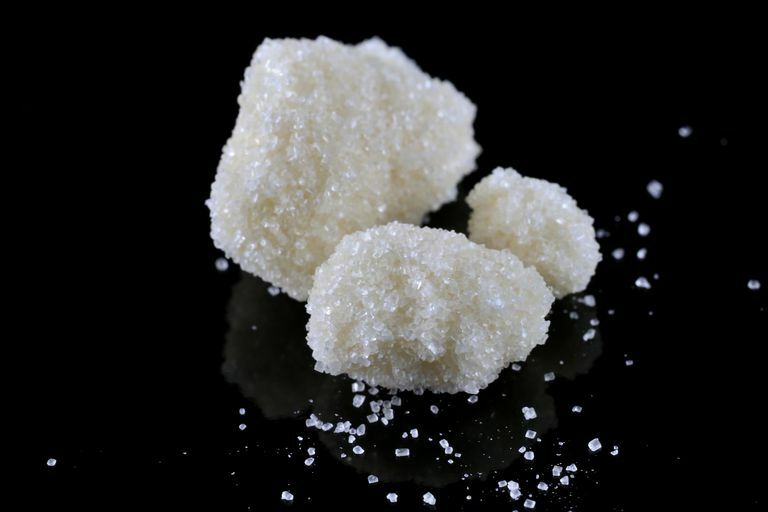 "Molly" is a slang term used for the pure crystal powder form of 3,4-methylenedioxymethamphetamine (MDMA). This is usually sold in capsules to distinguish it from Ecstasy pills that can contain sometimes harmful additives. However, law enforcement agencies have reported that capsules they seized that were supposed to be pure Molly actually contained methylone, a dangerous synthetic cathinone. The DEA's Drug and Chemical Evaluation Section reports that higher-dose users of the drug have reported cravings for more MDPV. This is one sign of developing a dependence or addiction to the substance. In 2012, Congress passed the Synthetic Drug Abuse Prevention Act which permanently placed 26 types of synthetic cannabinoids and cathinones into Schedule I of the Controlled Substances Act (CSA). The same law, part of the FDA Safety and Innovation Act of 2012, doubled the amount of time that the Drug Enforcement Administration (DEA) can administratively schedule substances under its emergency scheduling authority, from 18 to 36 months. The DEA says that because MDPV and other synthetic drugs are analogs of a drug that is on Schedule I of the CSA, "law enforcement cases involving them can be prosecuted under the Federal Analogue Act of the CSA." National Institute on Drug Abuse. Synthetic Cathinones ("Bath Salts")."DrugFacts. 2016. Romnek K, et al. Synthetic Cathinones in Southern Germany - Characteristics of Users, Substance-Patterns, Co-Ingestions, and Complications.​​ Clinical Toxicology.​ ​2017:1-6. doi:10.1080/15563650.2017.1301463. U.S. Drug Enforcement Administration. The Characterization of 3,4-Methylenedioxypyrovalerone (MDPV). 2010. U.S. Drug Enforcement Administration, Drug and Chemical Evaluation Section. Methylenedioxypyrovalerone [(MDPV) (1-(1,3-Benzodioxol-5-yl)-2-(1-pyrrolidinyl)-1-pentanone]. 2010.